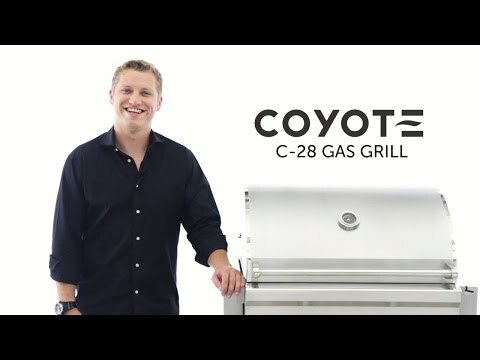 Merging durable design with professional-style grilling features, the Coyote C-Series gas grill will be the center point of your outdoor kitchen. This 28-inch freestanding gas grill is pre-assembled, so you can start grilling as soon as you get it out of the box. This grill also features 18 gauge 304 grade stainless steel construction with a double-walled canopy and continuously hand-welded grill box with seamless edges. The C1C28LP-FS gas grill offers stainless steel, performance enhancing heat control grids that minimize flare-ups and distribute heat evenly across the 497 square inch cooking area. This propane gas grill is powered by two, durable cast stainless steel Infinity burners which deliver up to 40,000 BTUs of cooking power. The burners are lit by an easy to use, push and turn ignition system while the internal halogen grill lights will keep you grilling into the night. Use the removable warming rack to keep food heated until serving time and easily monitor the temperature inside your grill using the integrated thermometer. The grill cart includes two, self closing doors for easy closures and fold down shelving which adds workspace to your grilling area. The double doors provide ample storage space for BBQ tools and grilling accessories. The cart also features industrial-style, locking wheel casters for portability and comes fully assembled so you can start cooking right away. Choose Coyote and create the outdoor kitchen of your dreams with a grill made to last and give remarkable performance. Cooking Grid Dimensions 25 7/8 X 17 1/4"
25 7/8 X 17 1/4" 22 3/8 X 18" 26 1/4 X 19" 25 1/2 X 17"